Pythagoras, from the Greek island of Samos, (c570-c495 B.C.) believed that numbers were the building blocks of all reality. He is given credit for the discovery of the Pythagorean theorem, which states that "the square of the hypotenuse of a right triangle equals the sum of the squares of the other two sides". In Hebrew, I AM THAT I AM is written as אהיה אשר אהיה (Ehyeh Asher Ehyeh), which has a gematria value of 543. 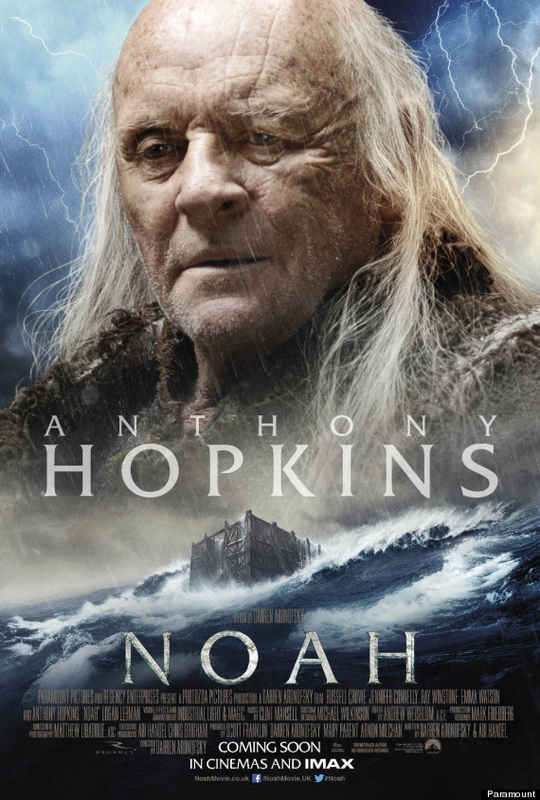 Moses, or in Hebrew משה (Moshe) has a gematria value of 345. 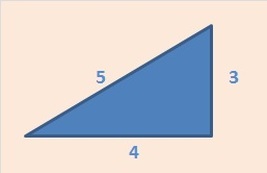 The numbers 3, 4 and 5 constitute the first Pythagorean triple. The Babylonian tablet from 1900-1600 BC describing the triangular geometry later made famous by Pythagoras. Plimpton 322 is in the collection of G A Plimpton housed at Columbia University. An old Babylonian tablet (1900-1600 BC), shown on the left, contains the so-called Pythagorean Theorem, except that it predates Pythagoras by a millennium or more. According to Neugebauer and Sachs (1946), the tablet lists in the two middle columns the numbers that satisfy the theorem. From the left, the first column indexes the contents of the table (1, 2, 3, …), the second and the third the hypotenuse c and the leg a of a right triangle all in sexagesimal numbers. The fourth column shows (c/b)2 where b is the basis of the triangle. For instance, the 11th row shows 75, 45, and 1.5625 = (75/60)2. 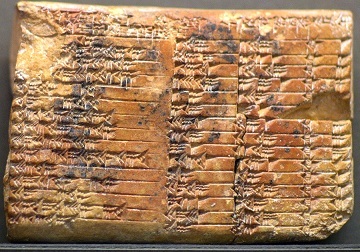 A translation of another Babylonian tablet preserved in the British museum states (John Heise): 4 is the length and 5 the diagonal. What is the breadth? Its size is not known. 4 times 4 is 16. 5 times 5 is 25. You take 16 from 25 and there remains 9. What times what shall I take in order to get 9? 3 times 3 is 9. 3 is the breadth. A Pythagorean Triple is a set of positive integers, a, b and c that fits the rule: a² + b² = c². Examples include 5, 12, 13 and 9, 40, 41. The first (smallest) Pythagorean Triple is 3, 4, 5. His name Immanuel (meaning "God (is) with us") is written in the original Hebrew שמו עמנואל and has a gematria value of 543. Shiloh is the Messiah, and in Hebrew שילה (Shiloh) has a gematria value of 345. Jesus replied to Peter (Mat 18:22) a brother's sin should be forgiven until seventy times seven (until Shiloh comes). The three pairs give a total of 500 + 100 + 50 +10 + 5 + 1 = 666 (the greatly misunderstood number of a man). The remaining numerals provide 1000 + 100 + 10 = 1110. 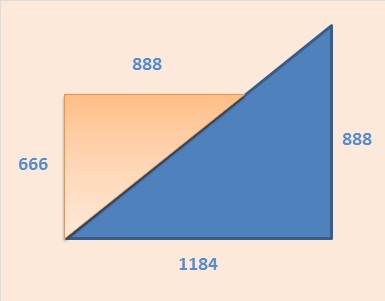 Together with 888, these numbers form an intriguing triangle. 5778 - 5433 = 345 (Pythagorean triple). More on 5778 later. which has a gematria value of 2368, as does Ιησους Χριστος ("Jesus Christ"). 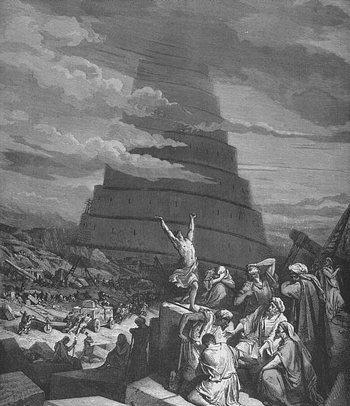 The Tower of Babel (Hebrew: מגדל בבל‎ Migdal Bavel) has a gematria value of 111. The millui (spelled out) gematria value for the letter aleph (אלף) is also 111. Using equidistant letter sequence (ELS), the longest sequence of alephs to be found in the Bible is ten, and 10 x 111 = 1110. This sequence is found using an ELS of 1850, which is 50 x 37. 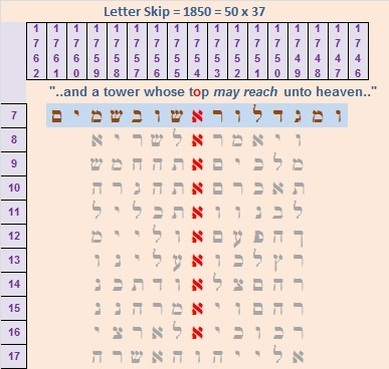 The first aleph in the sequence is found in the story of the Tower of Babel (Genesis 11:4), and is the middle letter of the Hebrew word for top וראשו (rosh). The sequence of ten alephs using an equidistant letter sequence of 1850 (50 x 37). 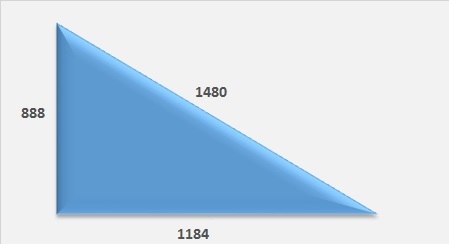 The gematria value of Χριστος ("Christ") is 1480, and the 1480th prime number is 12,401. The first occurrence of 12401 in the decimal digits of pi is preceded by the three digits 111. This is the 30,698th verse in the Bible (KJV). The first occurrence of 30698 in pi begins from position 133,977. You can search for the "tower of alephs" yourself by downloading a free demo ELS program here (3.8Mb). The number 70 is a familiar Bible number - witness Daniel’s 70 weeks prophesy and the threescore and ten days of our years. What is intriguing to this study is that the state of Israel was born in 1948, and 1948 + 70 years = 2018, which is 5778 on the Hebrew calendar. On May 14, 1948, the independent state of Israel was proclaimed as British rule in Palestine came to an end. May 14 = 5/14, and 5 x 14 = 70. The miraculous catch of fish at the Sea of Tiberias in John 21:10-11 which takes place after the resurrection of Jesus, contains an intriguing number puzzle. Why was the precise number of the catch mentioned in the account? There is also lore regarding a catch of fish in Pythagorean tradition. According to most accounts, Pythagoras happened upon a group of fishermen hauling in a large catch of fish. Pythagoras, it is said, predicts the number of fish which will be in the net, then commands the fishermen to set the fish free when his prediction proves correct. The exact number of fish is not mentioned in the story, but it is assumed to be 153, which was considered a sacred number amongst the Pythagoreans. The miracle of the Catch of 153 fish by Duccio, 14th century. Euler's totient function φ(n), used in number theory, sheds new light on this piscatorial problem. There is a mathematical connection between the gematria value of Jesus and the number 153. Why the Pythagoreans considered 153 to be a sacred number can be appreciated by the following calculation, based on the Earth's solar and lunar cycles. The first occurrence of 7 in pi appears at position 13, the gematria value of אחד ("one"). The word "one" appears 1967 times in the Bible (KJV), which was the year Jerusalem was reunited under Jewish rule. The third occurrence of 7 in pi appears at position 39, the gematria value of יהוה אחד ("one LORD") see Deu 6:4. Within the decimal digits of e, the first occurrence of 7 appears at position 1, and the third occurrence at position 26, the gematria value of יהוה (LORD). In Hebrew שבע ("seven") has a gematria value of 372. The first occurrence of 372 in pi begins from position 300. After Enoch begat Methuselah, he lived 300 years, and then he walked with God (Gen 5:22). It can scarcely be coincidence, then, that the firstborn of Methuselah (Lamech) lived 777 years, and then he died (Gen 5:31). 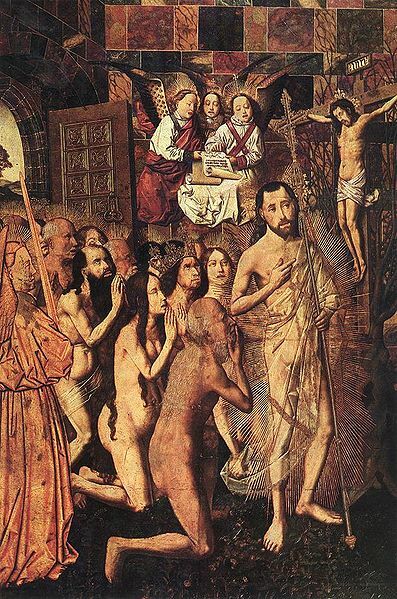 Christ Leading the Patriarchs to Paradise by Bartolomé Bermejo (c. 1480). Christ (Χριστος) has a numerical value of 1480. Methuselah, Solomon and the Queen of Sheba, and Adam and Eve lead the procession of the righteous behind Christ. Beginning from position 69 in pi are the three digits 640, the gematria value of שמש (shemesh, meaning "sun"), the most significant of the "great lights" in the firmament of heaven. Melchizedek (Melchisedec in the New Testament), is the king of Salem (later Jerusalem) and priest of the most high God (El Elyon) see Gen 14:18. Sha’ul (Paul) identifies Yeshua with the Melchizadek figure in Ps. 110:4. While the Talmud identifies Melchizadek as a son of Shem (b.Nedarim 32b) the Qumran community had a more mystical view. In a document found among the Dead Sea Scrolls (11Q13) Melchizadek is presented as a future Messianic figure who would redeem those that are his. This Melchizadek is called in the Qumran document "el" and "elohim," moreover Is. 61:1-3 is quoted in reference to him with "Melchizadek" substituted for YHWH. The Hebrew words El and Elohim primarily mean "God", but in certain contexts, elohim designates a "judge". Melchizedek is seen as presiding over the final judgement and condemnation of his demonic counterpart Belial/Satan, expected to occur on the Day of Atonement at the end of the tenth Jubilee cycle. And your ELOHIM is [Melchizedek, who will save them from] the hand of Belial. As for that which He said, "Then you shall send abroad the trump[et in] all the land (Lev 25:9) 11Q13 The Heavenly Prince Melchizedek. The phrase "And your ELOHIM is [Melchizedek]" has stunning confirmation within the decimal digits of pi. This is the first verse in the 110th Psalm. The first occurrence of 110 in pi is followed by the first occurrence of 555. The first occurrence of 15235 in pi begins from position 55,617 and is followed by those same five digits 55617. The next three digits are 276, the number of souls saved from the shipwreck (Acts 27:37). The term διακοσιαι εβδομηκονταεξ (two hundred threescore and sixteen) has a gematria value of 961. The first occurrence of 961 in pi is preceded by the second occurrence of 555. Acts 27:37 is verse number 27,893 in the Bible (KJV). The first occurrence of 27893 in pi is followed by those same three digits, 555. The word "Christ" appears 555 times in the KJV. The first and second occurrences of 555 in pi begin from positions 177 and 1,232.
the first 302 decimal digits of pi sum to 1346 ! The Queen of Sheba came to test Solomon with hard questions, all of which he answered to her satisfaction. After Solomon's prayer of dedication (2 Ch 6:12-42), the divine Presence filled the Temple (2 Ch 7:1-2). In the seventh month (Tishrei), they observed the dedication of the altar seven days, after which Solomon - and all Israel with him - kept the feast (the seventh feast - Tabernacles) a further seven days (2 Ch 7:8-9). The divine Presence which filled the Temple was כבוד יהוה ("the glory of the LORD"). Following the seven days of Sukkot, there is a sacred assembly on the eighth day called Shemini Atzeret (see Lev 23:33-36). This extra day is celebrated on 22 Tishrei, the eighth day of the feast of Tabernacles (הסכות). Shemini Atzeret is considered the eighth day of the celebration of Sukkot and represents Ha Olam Haba ("the world to come"), which follows after the Millennium. The Millenium follows six thousand years since creation, which continues the sabbath pattern established when God rested on the seventh day from all his work (Gen 2:2-3). The 7th star inside the 10th star. 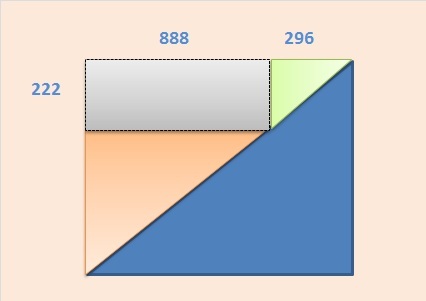 The area shaded light blue = 288, which is the totient of 888 (Jesus). 253 has four divisors (1, 11, 23, 253), which sum to 288. Solomon (שלמה) means "peace" (Strongs H8010). The word "peace" appears in 400 Bible verses (KJV). Beginning from position 400 in pi are the three digits 433, which is the 9th star number. 433 and 541 are the 9th and 10th star numbers. 541 is the gematria value of ישראל (Israel), whilst the first occurrence of 433 in pi is followed by the three digits 832, the gematria value of ארץ ישראל (Eretz Yisrael, meaning "the land of Israel"). 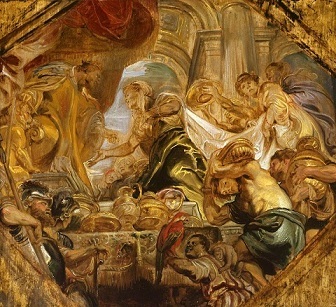 King Solomon and the Queen of Sheba by Rubens (1620). After Solomon's prayer of dedication, fire descended from heaven and the "the glory of the LORD" (כבוד יהוה) filled the Temple (2 Ch 7:1-3). * For an irrational number search engine, click here. The phrase "Let them give glory unto the LORD" (ישימו ליהוה כבוד) has a gematria value of 454. The first occurrence of 454 in e is followed by the three digits 424, the gematria value of משיח בן דוד (Moshiach ben David). When the Pharisees accused the disciples of illegally harvesting grain on the sabbath day, Jesus in his defense referred to David as a biblical precedent (Mat 12:3-4). Jesus explained that one greater than the temple is here (Mat 12:6). In Hebrew, בן-אדם (ben Adam, meaning "Son of man") has a gematria value of 97. The first occurrence of 97 in pi is preceded by the three digits 358, the gematria value of משיח (Moshiach, meaning "Messiah"). The term בן-אדם (ben Adam) appears 99 times in the Tanakh, which as you will see is the first of many repdigit coincidences in this narrative. Jesus continued his response to the Pharisees by explaining that grace takes precedence over sacrifices (Mat 12:7 cf Hos 6:6), and not that sacrifices should be condemned. 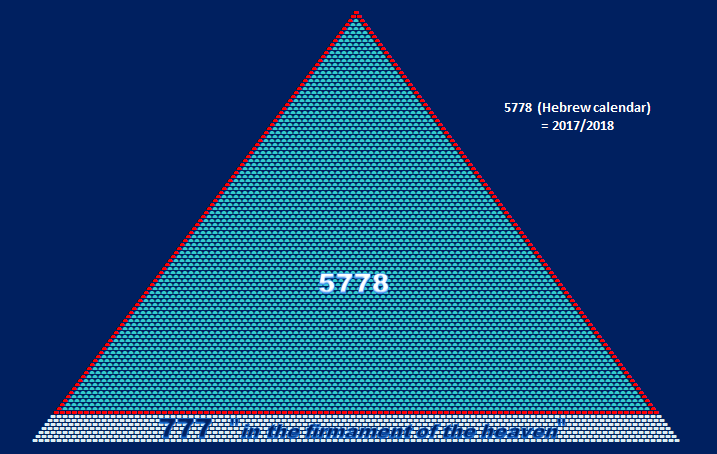 The Greek word σαββατον ("sabbath") has a gematria value of 626, which is a diminution of this verses' total gematria value, 6226.
the first occurrence of 6226 in pi begins from position 33,311. The perimeter count of the 433 star is 96. The first occurrence of 96 in pi is preceded by the three digits 555. The word "Christ" appears 555 times in the Bible (KJV). Lamech named him Noah (Noach) saying, This one will comfort us (Gen 5:29), connecting Noah with נחם (Nacham, meaning "to comfort"). The phrase "Comfort ye, comfort ye my people" (נחמו נחמו עמי) has a gematria value of 328. The first occurrence of 328 in pi begins from position 111. After the birth of Noah, Lamech lived a further 595 years. The first occurrence of 595 in pi is followed by those same three digits 919, the gematria value of Μελχισεδεκ (Melchisedec). For more on Melchizedek/Melchisedec, see The Stars of Heaven. 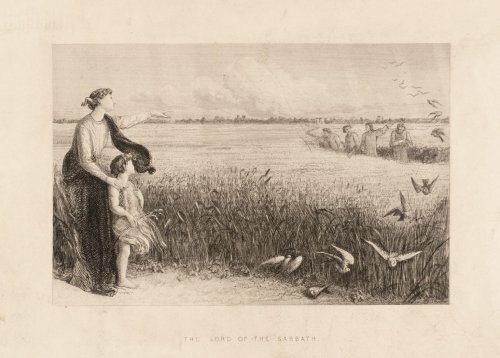 The Lord of the Sabbath by James Smetham (1861). Etching on paper. Tate Gallery, London. The first occurrence of 1861 in pi begins from position 424, the gematria value of משיח בן דוד (Moshiach ben David). The Pharisees' strict interpretation of the law deemed the plucking of a few ears of corn "work" by the hungry disciples, forgetting that the Sabbath is a time of delight (Isa 58:13-14). The phrase "Remember the sabbath day" (זכור את יום השבת) has a gematria value of 1397, the same as "the glory of God" (η γαρ δοξα του θεου) Rev 21:23. Exo 20:8 is the 2060th verse in the KJV. The first occurrence of 2060 in pi is followed by the three digits 999, and begins from position 23,985. The first occurrence of 777 in phi (the golden ratio) is preceded by the three digits 111, and begins from position 444. Before 111 are the three digits 177. The words "Lord" and "Jesus" appear together in 177 Bible verses (KJV). The following four digits are 8053, then the 153 made famous by the miraculous catch of fish in Joh 21:11. 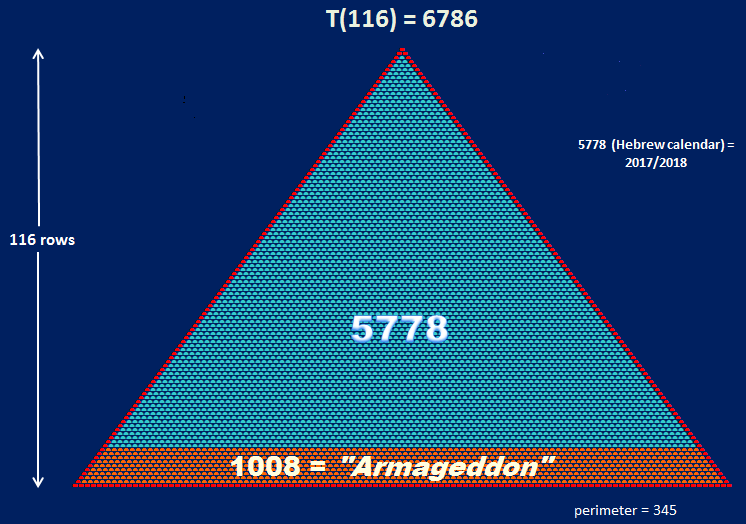 The first occurrence of 950 in pi is preceded by the four digits 5778, the 107th triangle number. 1008 is the gematria value of αρμαγεδδων (Armageddon) which appears once in the Bible (Rev 16:16). The word is a transliteration of the Hebrew הר מגידו (har megiddo, meaning "mountain" or "hills"). The first occurrence of 267 in phi begins from position 196, and is followed by the two digits 88. The Fibonacci and Lucas number sequences have intrigued amateur and professional mathematicians for centuries. The Fibonacci sequence begins with 0, 1 whilst the Lucas sequence begins with 2, 1. After that, the next integer in either sequence is simply found by adding the previous two numbers. These number sequences appear frequently in nature, such as branching in trees, the arrangement of leaves on a stem, the spirals of a sunflower, the flowering of artichoke, an uncurling fern and the arrangement of a pine cone. Try it for yourself. Pick up a pine cone. Notice how the segments are arranged in spirals - one set of spirals going one way (in green in the picture), and another set of spirals going the other way (in red). Now count the number of spirals. It will always be a Fibonacci number, and the opposite spirals will always be an adjacent Fibonacci number. The same is true for pineapples, cauliflowers, broccoli, you name it. 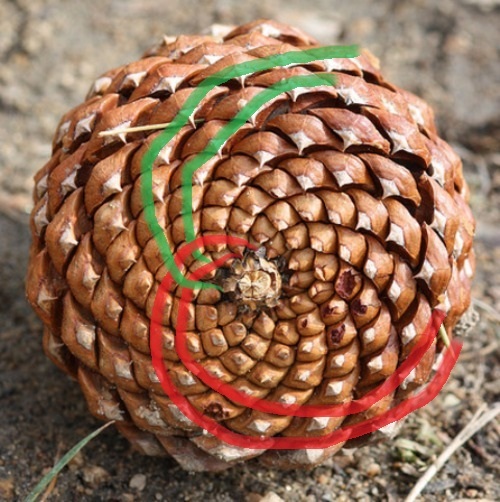 The opposite spirals on a pinecone are always consecutive Fibonacci numbers (commonly 8 and 13, or 5 and 8). These numbers are closely related to the golden ratio. By dividing a number in either sequence by its predecessor, an approximation of the golden ratio, phi or φ is achieved. The higher the numbers, the more precise the approximation. It can never be exact because phi is an irrational number, which means it cannot be expressed as any two integers a/b. For example, 5778 / 3571 = 1.618034... which is very close to the exact value of phi which is (1 + √5) / 2. Note that phi, the golden ratio, is not to be confused with Euler's totient function. Although both use the same Greek symbol φ, they are unrelated functions. 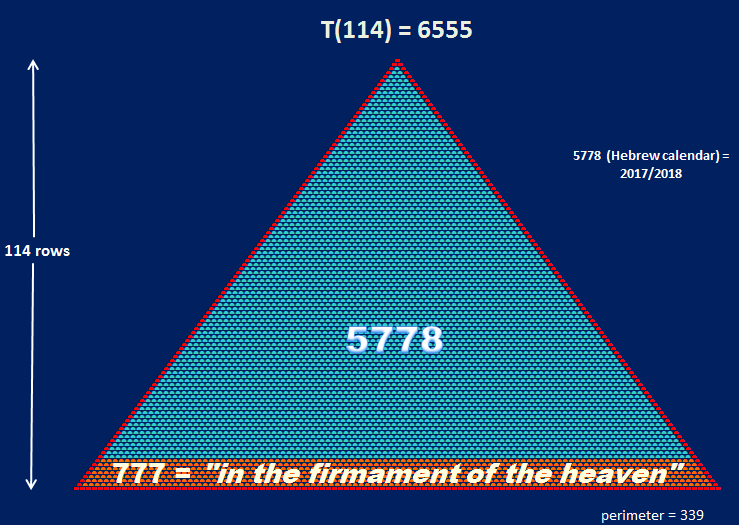 5778 is the sum of four consecutive Fibonacci numbers (...610, 987, 1597, 2584...), but what makes 5778 special is that despite an infinite number of Lucas numbers, it has been proven that only three of these are also triangular. Those numbers are 1, 3 and 5778. Remarkably, phi raised to the 18th power equals 5778. 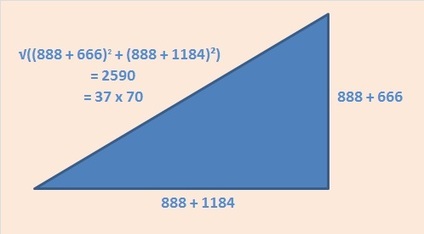 The significance of number 18 can be appreciated when the 5778 triangle is deconstructed into 18 segments. It can be seen that the Genesis 1:1 triangle (and its constituent parts) together with the mysterious triangular number 153 figure prominently in the 18 piece 5778 jigsaw. The overall picture is a tolerable illustration of the miraculous catch of fish outlined in John 21. The three pieces representing the sky total 1998, which is the gematria value of "In the beginning God created the heaven..." from Gen 1:1, whilst the 1088 trapezium (the boat upon the waters) matches the gematria value of Psalm 145:17. "The LORD is righteous in all his ways, and holy in all his works"
Without doubt, 5778 is an important gematria number. Of particular interest is that 5778 on the Hebrew calendar coincides with 2017-2018 on the Gregorian calendar. The Hebrew year 5778 coinciding with 2018 on the Gregorian calendar is significant, as it was in the year 2018 AM that God made the first covenant with Abraham. (AM = Anno Mundi, or years since creation). This was 70 years after Abraham's birth in 1948 AM. The new independent state of Israel was established in 1948 Gregorian, so 2018 will also be 70 years (or a generation, see Psalms 90:10) since then. 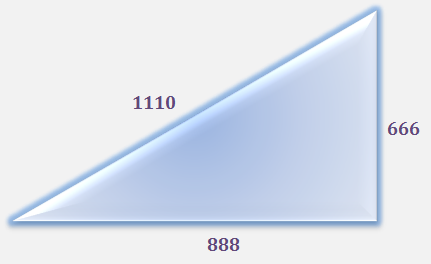 5778 is the 107th triangular number. The Hebrew word for mankind is spelled ADM, which many kabbalists say is an acronym for Adam - David - Moshiach. King David was born in 907 BCE, which is 2854 on the Hebrew calendar. David is the comprehensive soul of all mankind, and is the forerunner of Moshiach, who brings about redemption for all mankind. David lived for 70 years, so the midpoint of his life was in the 2889th year since creation. This year was also half way towards the year 5778! The half way point in David's life was the half way point between the year of creation and 5778. It is said that Adam was created to live for 1,000 years, but gifted King David 70 years of his life (Zohar 1, 55a). Together, the years of the lives of Adam (930) and David (70) sum to the 1,000 years of the Messianic era (the millenium). You can read more about the significance of 5778 at kabbalahsecrets.com. We have seen how 1776 can be organized into three pairs of Roman numerals, separating the numbers 1110 and 666 which form a Pythagorean triangle with 888. 1000 + 100 + 10 = 1110, and 500 + 100 + 50 + 10 + 5 + 1 = 666. 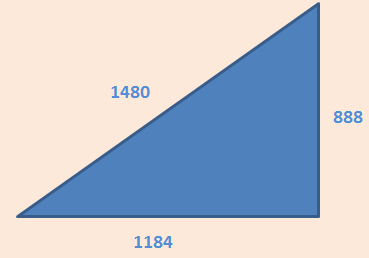 Pythagorean 3:4:5 triangle with sides 666 and 888, and a hypotenuse of 1110. One World Trade Center has been crowned the tallest building in the Americas, standing at a symbolic (and now official) 1,776 feet. The Council on Tall Buildings and Urban Habitat, an international body that determines the heights of skyscrapers, has ruled that the spire atop One World Trade is an architecturally significant feature of the building — not an antenna. Writing the Declaration of Independence, 1776 by Jean Leon Gerome Ferris (1863 - 1930). Thomas Jefferson (right), Benjamin Franklin (left), and John Adams (center) meet at Jefferson's lodgings in Philadelphia, to review a draft of the Declaration of Independence. Adams and Jefferson were the 2nd and 3rd Presidents of the United States. Both died on the same day - 4 Jul 1826, 50 years to the day after the signing of the Declaration of Independence, of which all three men were signatories. "The eyes of the world will be upon us. We are as a city upon a hill, raised up. You may think we're in the howling wilderness. You may think we're out beyond the farthest beyond. But in fact, God's providence is such that as the latter days begin to unfold, this may indeed be the city, the new Jerusalem that's unfolding before not only our eyes but the eyes of the world." 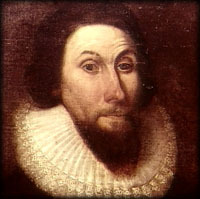 John Winthrop sermon to the Puritans on their journey to the New World. Read more about the notion that America was the New Jerusalem from the PBS Frontline program "Apocalypticism Explained - The Puritans". According to the sages, Messiah must come (return) no later than 6000 years since creation. It can be sooner, but no later than this date. This is in keeping with the Sabbath pattern - 6000 years since creation followed by 1000 years of the millennium. A thousand years are equivalent to one day in the eyes of God, as is written in Psalms (90:4). are the period of the Torah, and the following two thousand years are the period of the Messiah." For sure, man's number is up after 6,000 years! A further clue can be found in Genesis 1:1, who's 28 Hebrew letters include 6 alephs. These six alephs occupy letter numbers 3, 9, 10, 15, 23, and 26 of Genesis 1:1, and the sum of these numbers is 86, the gematria of Elohim (אלהים), the third word from Gen 1:1.